When I came to the end of my last post I wondered if I should write a conclusion to the whole series. Maybe something on the Earl Grey Irish Famine orphans’ contribution to Australia. Was H. H. Browne correct in his assessment? Were the orphans of little use, and ‘distasteful’ to the majority of colonists ? Or did they make an valuable contribution? Along with convict women, they became ‘mothers to the Australian character’? However, if they are set in context beside the c. 9,000 single Irish females who immigrated to New South Wales in 1840-41, the 5,000 who came to South Australia in the mid 1850s, or the 70% of female government assisted migrants to Victoria in the 1850s, we might gain a more realistic picture of where they stand. This is not to deny the orphans their unique position as destitute famine refugees. Nor the particular hardships they faced. To do this might require me going back over everything,– to reorganize, rewrite, polish, and rewrite again. Maybe a publisher would be interested in a small print run. But then I remembered what I’d written in earlier posts (4, 13 and 19) about histories of individual orphans. Could we reconstruct their experience at local level in Ireland and match it with the same detailed local history in Australia? Could we put together life histories of individual orphans, maybe even inter-generational family histories? Or compare their experience in different regions–the Illawarra and Hunter Valley in New South Wales, around Ipswich in what was to become Queensland, the goldfields of Victoria or Clare Valley in South Australia, for instance? And what do we do with the ‘lost’ souls, the Mary Littlewoods or Georgina Mulhollands or the Mary Ryans we cannot find? http://wp.me/p4SlVj-p7 outlined some of the problems we’d face. How to tell the orphans’ stories raises all sorts of issues: properly navigating copyright issues and acknowledging one’s debt to others; how best such family histories might be integrated into a larger historical context. I particularly liked the way Kay Caball wove orphan family histories into her Kerry Girls. Elizabeth Rushen and Perry McIntyre put information about individual Red Rover (eary 1830s) women into an Appendix in their Fair Game (Anchor Books, 2010). Doing something similar would only enhance my little history of the Irish Famine orphans–should I have the talent or the energy. But don’t hold your breath. I wouldn’t want to trespass on people’s privacies. One work I’ve lately been taking inspiration from, is the delightful Common People by Alison Light (Penguin, 2015). Let me try to understand why. It’s a book that shows me just what family history can be, maybe even should (?) be like. I’m a sucker for good writing whether it’s Ames talking to Jack Boughton at the end of Gilead (Marilynne Robinson); or a black crow and Morrigan at the end of Gun Street Girl (Adrian McKinty); or whether it’s lyrical writing, full of pathos, or hard-headed, clear, honest and direct as it is in Common People. Here’s how Alison Light writes about the death of her great-grandmother Sarah Hill, in Netherne Asylum, in 1911. Her transparent, in your face, honest presence throughout the book is a real breath of fresh air for someone like myself who was trained to distance oneself and write history essays and theses in the third person. We were taught objectivity may not be achievable but it is always worth striving for. Laudable aims, I’m sure. Yet Alison Light’s presence–she’s everywhere–makes her work very personal. It gives a piquant sharpness to her book which makes it interesting to readers other than her immediate family and like minded ancestor hunters. “I…hoped that my speaking voice would anchor the reader as we moved through time (p.xxiv)…I find that her people had long been on the move (19)…I need a larger-scale atlas as William travels back into his childhood (19)…In the wake of my father’s death I took to tinkering about in the Portsmouth Record Office (70)…I feel tender towards those who refused to conform…cocking a snook…at squire and parson (117)…If anywhere can claim to be my ancestral home it is the workhouse. Somebody in every generation fetched up there (233)…I now know that nothing about a graveyard can be taken at face value (252)”. What lifts her book to a wider audience still, is her self-reflection, and examination of why so many people research their family’s past. A reader must be made of stone not to stop and think about her ‘meditations’. “My first instinct in writing Common People was to find the people who had been missing from my past. I wanted…to rescue them…from sheer oblivion (p.xxv)… When my father was very ill with cancer, I went in search of his mother’s grave. It was an odd, possibly morbid thing to do. Family history begins with missing persons—missed in both senses of the word. But when do we register an absence as a loss? (p.11)…Family is never one organism but fissiparous, endlessly dividing itself. In a family tree everyone seems connected, but in life families ‘fragment’…People want to know where they came from but they also want to know where they could have gone and why their branch of the family did not go there (93-4)…Genealogy has long fostered grandiloquent forms of family romance and been a source of reassurance to antiquarians, cranks and snobs…humble aspirants elevate themselves…believing there was once a family pile or manor in the past…If the creation of a nation rests on its ‘foundation myths’, family legends too, handed down the generations, are also the stuff, like dreams, of which we make ourselves (130)”. Can you see yourself in any of this? Common People is full of such reflections challenging readers to ask themselves what exactly do they want, and why? What appeals to me most of all about her book is how she does her damnedest to put her family into historical context. She is willing to cast her net widely, not only into nooks and crannies but over the big-picture historical context, as often, and as much as she can. Sure, in any family history there are dead-ends and blind alleys and people you’ll never really know but if you merely want a family tree, lives shrunk between dates in brackets, you’re missing the sweetest thing of all. Any family history worth its salt will go further and ask questions about ‘economic forces’, politics, religious and social conditions, and the like. Alison Light invites us to take ourselves into ‘history’, with its different interpretations and debates and argumentative soul; make our family members more than ‘singular’ and unique but representative of something larger. Her book is also about working-class Britain ‘on the move’ during industrialisation in the nineteenth century; her ancestors act as ‘intermediaries between the living and the dead’ charting an unglorious story of poverty throughout much of the twentieth as well. (Many of these phrases are hers. I do them less than justice). We may regret that we don’t have the same wealth of resources at our disposal in Ireland or Australia–not the same access to census data, or county histories, or a tremendously rich array of local social histories, as Alison Light had for Common People. But don’t despair. I’m sure there’s plenty we can use. I’m not the best person to ask about this. Maybe others can make some suggestions? Gerald Walsh, Pioneering days. People and innovations in Australia’s rural past, Allen & Unwin, 1993. I’m sure there are plenty more. Your local librarians, local historians and Archivists will be only too pleased to help you. See for instance two recent ones I mentioned in an earlier post, Libby Connors, Warrior, Allen & Unwin, 2015 and Tanya Evans, Fractured Families. Life on the margins in Colonial New South Wales, UNSW Press, 2015. Tanya with the help of family historians skilfully recounts the history of Jane Kelly per Digby in chapter five. And what if we approached from a different direction? By travelling in the footsteps of the people you’re interested in? Here’s a link to Peter Higginbotham’s great website. Go to Ballyshannon workhouse or whatever is left of it today and make your way to Dublin’s North Quay. Then, since there is no longer a boat to Portsmouth, take the ferry from Rosslare to Holyhead. You are experiencing a similar route to the one your orphan ancestor took. I travelled on that ferry a few times many, many, years ago. I’m not sure what it’s like today. And in Australia, it may be impractical to travel as orphans did with Surgeon Strutt, by cart, over Razorback, southward to Yass and Gundagai. But you get the idea. Take the journey nonetheless. Go to the workhouse ‘your’ orphan came from and travel to Dublin or Cork. Follow her footsteps as much as you can after she arrived in Adelaide, Sydney or Melbourne. It’s an experience worth having; you are trying to relive her ‘history’. Is that too crazy? I’m sure you will have other and better ideas. Perhaps you’d share them? My thanks to the late Lionel Chapman for the family photograph at the head of this post. It has Johanna Kelly in a wedding photograph in 1907. This entry was tagged Alison Light, Common People, Dublin Famine sculpture, Famine orphan family histories, Fractured Families, Kay Caball, Local history, Red Rover, Tanya Evans. Bookmark the permalink. I have another great x 2 grandmother named Bridget ( Biddy) COLLETON who arrived on the ‘Confiance’ Adelaide Sept 12th 1854 age 21yrs. It has taken me a long time to find her on a shiplist as her name changed many times on marriage and birth cerificates. I eventually found her only because her name written next to Anne WILLIAMS name, age 18 yrs on the ship list and both were servants from Kilkenny. Anne was witness to Bridget COLLINSON and Johann Traugott WEINERT’S marriage at the Mount Barker Catholic Church 28.08.1856. Johann Traugott was from Lobethal. Bridget died as Mary Ann WEINERT 02.08.1919 age 85 yrs, buried Lobethal cemetery, 75 years in the colony, (should be 65 years), age 18 at marriage, 5 females living, 3 males living, 1 female dead, 1 male dead, cause of death Influenza and sanility. Names on birth certificates include Calussen, Collisson, Colton, Cullighan, Lotten, and Beate Colluson! Bridget Colleton/Weinert was not a witness at the wedding of Anne WILLIAMS (father Michael) aged 21, house servant) to Conrad Diedrich Engleking aged 27, farmer on the 11th of March 1858, at the Anglican Church Balhannah. However her sister-in-law Johanne Pauline Weinert (recorded as Pauline Weinert, occupation housekeeper) with a farmer with the initials F.D were present. Do you think that I have cracked it???? Conrad Diedrich Engleking was a brewer at Lobethal and died on the 4th of October 1883 aged 52. Cause of death: dropsy, also known as edema. Anne nee Williams Engleking died on the 22nd of February 1870 aged 36yrs 9 months. Cause of death: diaphragmatic paralysis. 15 years 5 months in the colony. Maria Henrietta Engleking died on the 20th of January 1864 aged 4. Cause of death: Scarlatina or Scarlet Fever. I can assume that Bridget and Anne were at the Mount Barker depot and know that they both married prominent German men from Lobethal and resided there. Why was she known as Mary Ann instead of Bridget??? I would like to know where the two girls came from in Kilkenny and I have had no success in finding any information. Clues needed please. I can forward a photo of Bridgit. Pleased to see that a records of these South Australian girls are being collected. Thanks you for your hard work. Yes, I sent the information to the site you suggested. Perry and I are exchanging emails. Looks good. With thanks, Carol. Trevor, I’m looking into the suggestions you made about Mary Ann Byrnes of the William Stewart, but in the meantime I have another question. If I can identify 3 Irish orphan girls as my direct ancestors, do I win a prize?! The ship’s name “William Stewart” kept tickling something in my memory, so I went back and checked my various family folders. My maternal grandmother’s mother was the daughter of Mary Martin, who came to Adelaide on the Roman Emperor – we’ve got a full picture of her story since she came to Australia and there’s no doubt that she is one of the Earl Grey girls. My maternal grandmother’s father was the son of Margaret Murphy nee Hogan and he was born in Melbourne. Margaret’s details as recorded on her children’s birth certificates (god, I love the extra info you get from Victorian certificates!) consistently show that she was born in 1827/8 in Tipperary. Her death certificate records that she came to Victoria in 1848. The passenger list from the William Stewart includes a Margaret Hogan from Tipperary of the right age, and I can’t find any other Margaret Hogan the right age in the right year. Do you think that is sufficient for me to be satisfied that “my” Margaret is the one on the William Stewart? If so, both of my maternal grandmother’s grandmothers were famine orphans. That may explain my mother’s tendency to wildly over-cater for family functions. Certainly does deserve a prize Fiona. What would you like? 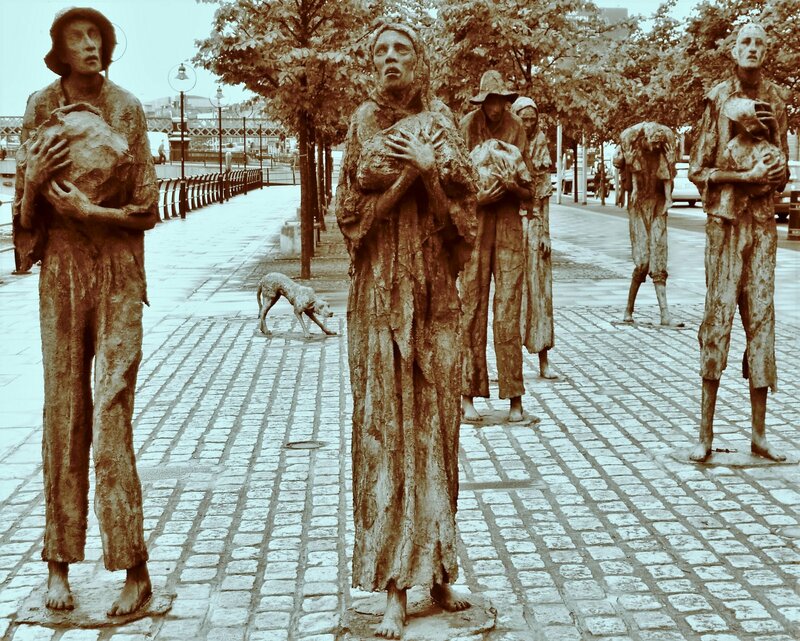 Was Margaret Hogan from Cork or Dublin foundling hospital? Unfortunately without parents’ names it’s difficult to be sure if we have the right one. You look to have enough (?) circumstantial evidence to support your claim. How about a trip to Ireland as your prize? May have to award it to yourself-no? Trevor, I think Honora Carroll on the Panama, 12 January, 1850 is one and the same as the Ann Carroll who married Francis Madden in St Francis Xavier’s Church, Wollongong on 27 February, 1851. I have a copy of the marriage certificate. One of the witnesses is Catherine Fadden, Surely, she was on the Pamana, too. All parties made their mark with an x. Spelling of Ann’s Christian name varies across the births of her ten children and in death registrations; Anne Norah, Anorah, Ann Norah, but I don’t think I have seen Honora! She died in November, 1899 in Milton, four days before Francis. Please let me know if further information is required. I’ve been researching the Madden Family for so long and have to get it all tied together before I’m in my dotage. Thank you for what I have gleaned through readings. Thankyou Carol. Do her parents’ names listed on the shipping list correspond with those that appear on the birth registrations of her children born after 1856? Have you sent your info to http://www.irishfaminememorial.org may I ask? Trevor, I have a suggestion as to how you could publish conclusions of your work and stories of all the orphan girls. I recently set up a database of 2300 WW1 soldiers for my local area at adoptadigger.org. Each soldier is “adopted” by a researcher (often a family member) who types the information and adds photos directly onto the website. Only the adopter and the site administrator has access to that particular soldier’s page, for security reasons. There are many other links on the website to stories, photo galleries etc, also to research links. It was a great way to get the project “out there” and we were contacted by many, many descendants who were delighted to see their ancestor on the website and we received wonderful photos, letters and family stories. Also, many descendants made contact with each other this way. Just an idea! I am sure there are countless good ideas out there so hopefully others will come in with their “two bob’s worth”! Thanks for that Chrissy. Great idea. Perry has something like that on the irishfaminememorial website, I believe. You are not going doo-lally. This reference is in the text of your recent post. You just forgot! We had the pleasure to visit the towns in 2014 where our Irish orphan Rosanna (Rose) Cartwright was born. Although we have never found her birth, we found her parents and brothers & sisters. The assistance of local historians in Edenderry and the wonderful people in the Archives in Dublin was worth 10 years of research from this side of the world. Have really enjoyed all your work. Thanks for the links I shall spend some time looking through them all. Once again great links for us to follow up on. I will send this email to a couple of my nieces who have only recently developed a real interest in their family history. I will create a link between them and the works of people such as yourself, Richard Reid, Perry Mcintyre, Cheryl Mongan etc, who have assisted me greatly over the past 35 years on behalf of my famine orphan ancestors, Bridget Davis, Margaret Reardon and Bridget Mahon.